Staff members are aware and constantly reminded that all students are fully capable of post-secondary education. Our job is to help them find their strengths and look at their options. This will include 4-year universities, 2-year technical schools, vocational programs and military training. 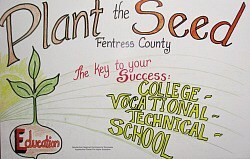 Our goal is to “plant the seed” that all Fentress County students can succeed and give them every opportunity to pursue their education goals. We want all Fentress County youth to develop the mindset to continue their education beyond high school.